Since it’s the month of Halloween, now is a good time to review Clive Barker’s dark fantasy/horror novel Sacrament. Barker is a well-known horror novelist; perhaps not to Stephen King’s level, but if anything more respected by fans of the genre. Sacrament is, like most horror stories, unusual. It deals with endangered animals and extinction, and I suppose it could be called a bit “green,” but that’s not why it’s of interest to furries. 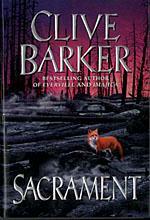 Lord Fox lurks in the pages of Sacrament, and he’s a different kind of furry fox, but strangely familiar. The story begins with Will Rabjohns, wildlife photographer, as he sets out for the North to photograph polar bears – except he isn’t entirely up there for the polar bears. He also knows a hermit is there; a hermit who once met a strange pair of characters, Rosa and Jacob, whom Will also met in his childhood in England. It seems these two aren’t entirely human; Jacob is a sort of hunter who knows instinctively where the last members of animal species can be found, and together he and Rosa kill them. Will’s encounter with these two has haunted him for years, and he has been trying to find them. Unfortunately, the hermit is not much help. To top it off, a polar bear decides it’s a good time to attack. While Will recovers from this encounter, he begins to be visited by another nightmare from his childhood; an anthropomorphic fox named Lord Fox, who begins to reveal what exactly Jacob and Rosa are, where they came from, why they were created and what their final goal is. Obviously, it would be spoiling to reveal these things, but also frankly impossible to really get across what’s going on without reading the book. It wasn’t a man in a fur coat and peaked cap: It was a fox. A dream of a fox, with a burnished coat and needle whiskers and black eyes that glittered like black stars in its elegantly snouted head. It stood easily on its hind legs, the pads of its forepaws slightly elongated, so they resembled stubby fingers. In other words, a fair description of countless furry artworks. Lord Fox is not some kind of were-fox, neither is he a form of kitsune; he began life as a normal fox, until he, like Will, crossed paths with Jacob. Unfortunately for Lord Fox, one of the few people Jacob cared for committed suicide near the fox’s den, and he naturally scavenged the corpse, eating the man’s … well, it wasn’t his nose, anyway. Jacob curses Lord Fox into this form, turning him into a fox spirit. At first, it isn’t certain what side Lord Fox is playing for; he is obviously against Jacob, but his initial appearances involve threatening to eat Will if he doesn’t do what he wants. Furries will be rooting for him to be a good guy; the fact of the matter is that he totally is, and that’s awesome. If you’re looking for something scary to read for Halloween, but still pretty darn furry, than check out Sacrament. It’s a creepy, Gothic story full of fascinating as well as horrifying monsters. Highly recommended. Oh, I will check this out! And, Crossafiction, you are better at writing articles than commenting on them. Here you did a darn good job. Just wanted to throw that in. That's because I edit my articles, and so does Green Reaper. I have worked as an actual newspaper reporter, and have had only one paid to edit editor who was actually better than GR as an actual editor. I'm freeballing my comments. See, if I was editing my comments, I'd have decided on a better word than freeballing, but I'm not, so I didn't.